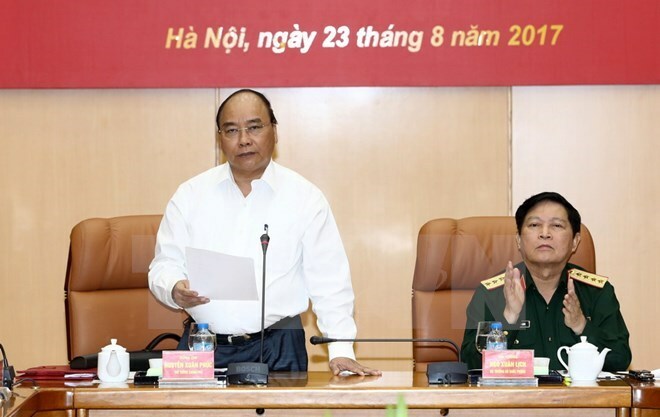 Hanoi (VNA) – Prime Minister Nguyen Xuan Phuc on August 23 chaired the first meeting of the Central Steering Committee on Defence Zones, which aimed to review the performance of the committee in building and operating defence zones in 2016 and the first six months of 2017. Addressing the event, PM Phuc, who is head of the committee, stressed that the building of defence zones is an important strategy of the Party and State. He said the committee should make local authorities and military zones thorough understand the importance of the mission, in order to continue implementing the Party’s policy on defence-security and the 10th Politburo’s Resolution 28-NQ/TW on turning centrally-run provinces and cities into firm defence zones. In 2016 and the first six months of 2017, the committee gave advices to the Party, State and localities on designing defence and military tasks and policies. The committee also involved in the building of socio-economic development strategies in association with reinforcing defence and devising solutions to arising problems in defence, security and external relations. The committee worked closely with other ministries to issue many important documents, including a decision on the formation of military zone steering committees on defence zones. In the rest of 2017 and 2018, the committee will continue developing community-based defence with active engagement of the Party, the entire society, army and the political system.